Bernanke knows QE3 will fail to revive the real economy, but he doesn’t care; his real job is to protect the Fed’s political power and the banking sector’s wealth. The unleashing of QE3–unlimited money-printing in support of the financial Status Quo– is proof the Fed has failed, failed, failed. If anything the Fed has done in the past four years had actually had a positive consequence in the real economy, Bernanke would have identifed that policy and expanded it in a measured response. Instead he went all-in, emptying the Fed’s toolbox in one big dump: unlimited money-printing, unlimited propping of the mortgage market, unlimited support of low Treasury rates and three more years of zero-interest rate policy (ZIRP). Here is the translation of the Fed Chairman’s public comments: whatever. Did you see any of his testimony? It was painfully obvious that either 1) he was sky-high on Ibogaine or 2) he was just going through the motions, duly enunciating PR “cover” that he finds tiresome to repeat and impossible to say with any sincerity or conviction. The key phrase here is “for whatever reason.” In other words, it doesn’t matter how artificial or phantom the increase in their assets may be, any increase is presumed to be good enough to trigger a “wealth effect” euphoria that generates a pressing urge to borrow and spend money. It is clear Bernanke’s policies have failed to spark a “wealth effect,” even though the stock market has more than doubled from its March 2009 low. The reason for this is self-evident: 83% of all stocks and bonds are owned by the top 10%. The bottom 90% feel little if any wealth effect from a new bubble in equities. The other factor is the legitimacy of the rise in asset valuation. People have been burned twice in one decade by Fed-blown asset bubbles, and they can now discern the difference between an organic expansion of assets based on a healthy increase in demand driven by higher wages and productivity and a central-planning bubble based on shadow intervention and massive money-printing. Are the Fed governors really so intellectually incontinent that they can’t recognize that the jig is up, and people now understand the difference between central planning manipulation and a legitmate Bull market? No, of course not. 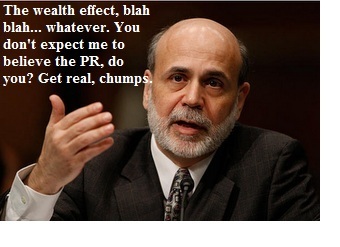 Bernanke knows QE3 will fail, but he doesn’t really care. His job is to protect the Fed’s political power and the banking sector’s wealth. He is doing an excellent job at his “real” job while failing catastrophically at his PR job of reviving the real economy and employment. 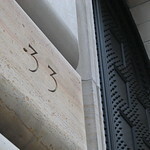 It’s no secret that the Federal Reserve exists for one purpose–to protect the wealth and power of the banks. This can be illustrated by one question: does the Fed loan funds at 0% to households or communities? No. It loans “free money” at 0% to the banks so they can loan money to students at 7%. When the banks get in trouble, the Fed rushes to loan them $29 trillion. When a student gets in financial trouble, he is hounded for the rest of his life by rapacious debt collectors. Despite the transparency of its raison d’etre support of a neofeudal financial Aristocracy, the Fed presides in a nominal democracy and thus faces increasing political pressure as its public PR goals–maintaining stable prices, i.e. moderate inflation, and full employment–are clearly not being met. The Fed thus needs to “manage perceptions” to maintain its facade of omnipotence and competence. Thus Bernanke’s “all-in” bet has a political propaganda angle. As a student of the Great Depression, Bernanke is keenly aware of the conventional criticism (mostly wrong, it turns out) that the Fed “didn’t do enough” in the Depression. Thanks to his defensive launch of QE3, he can shrug and sigh, “We did everything possible.” The blame will fall elsewhere, and the Fed will have a free hand to continue its real purpose, the defense of bank wealth. That’s the plan, but the Fed is failing here, too. Tasked by the financial Aristocracy to stave off any political rebellion that might threaten their chokehold on the U.S. economy and machinery of governance, the Fed is fanning the flames of just such an insurrection by ramping up inflation even as median household incomes plummet. Courtesy of frequent contributor B.C., here is a chart correlating the cost of oil with the expansion of the monetary base. Surprise, surprise–the more money you print, the higher the price of oil and gasoline. If there is one thing we can safely predict, it’s the stall speed of the U.S. economy is highly correlated to the price of oil in U.S. dollars. Push the price of oil much above $100/barrel and you will push the U.S. economy into a recession that will not respond to the feeble “wealth effect” felt by a dwindling share of U.S. households. Did anyone on the Fed Board notice that retail investors have been fleeing the rigged U.S. stock market in droves? The number of people who actually believe their stock market “wealth” is not the ephemera of Fed fumes and proxy intervention is dwindling fast. The 3-card monte game is fooling fewer and fewer serfs. If protecting bank wealth and power means jacking up inflation, pushing down wages and flying the U.S. into the box canyon of deep recession and higher unemployment, what do Ben and his Merry Band of Reverse Robin Hoods think the consequence will be politically and socially? You know my thinking on the matter of neofeudal dominance and financial repression: Resistance, nonviolent Revolution, Liberation.